No kidding, on April 1, I attended the meeting, "A National Conversation on the Economic Sustainability of Digital Information" here in Washington. The meeting was hosted by the Blue Ribbon Task Force on Sustainable Digital Preservation and Access. Assembled to study economic sustainability of digital information, the task force was truly "blue ribbon". Among the members were Sayeed Choudhury (Associate Dean/Director of the Hodson Digital Research & Curation Center, Johns Hopkins University), Fran Berman (Vice President of Research, Professor of Computer Science, Rensselaer Polytechnic Institute), Brian Lavoie (Research Scientist, OCLC), Clifford Lynch (Executive Director, Coalition for Networked Information), and the Smithsonian's own, Anne Van Camp (Director, Smithsonian Institution Archives). 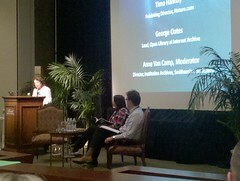 After a keynote address by Thomas Kalil (Deputy Director for Policy in the Office of Science and Technology Policy, Executive Office of the President of the United States), the full day meeting was organized around a series of "conversations" in which invited interlocutors conversed on topics related to digital preservation. 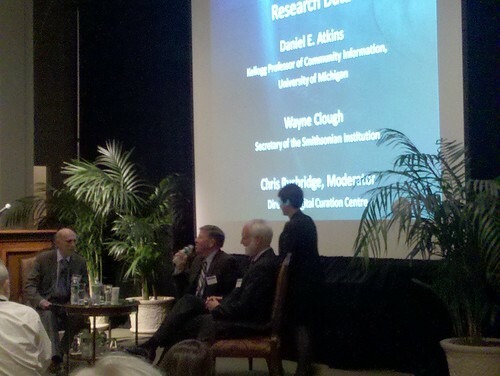 Secretary Clough, participating in the "Conversation about Research Data", in his introductory remarks and follow-up questions specifically mentioned the Biodiveristy Heritage Library as an example of an important digital project. He also, when asked about the future of libraries, pointed to the "Information Commons" created at George Tech Library during his tenure at Tech. The agenda is listed below; the full report and more information can be found at the Blue Ribbon Task Force home page. I highly recommend reading the both the full and interim reports for important directions that libraries will be heading towards. 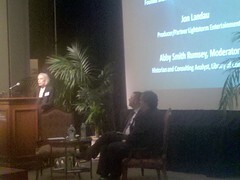 Clifford Lynch (Executive Director, Coalition for Networked Information), provided summary remarks. As an aside, it was neat to chat a bit with movie producer Jon Landau (Avatar, Titanic) about how to draw audiences (whether they're movie goers or book readers) into a story; and Vint Cerf (one of the "fathers of the Internet, along with Robert E. Kahn), currently Google's Chief Evangelist.